The perfect remedy for a cold, rainy day. It’s raining in Nova Scotia, and a little on the cool side. In Eastern Canada many of us will break out a pot and make something to “warm the bones.” That means chowder. I’ve been making this chowder for decades. Its origin is lost in the mists of my mind. It’s an excellent soup. Just cooked chunks of haddock (or sole if you wish), delicious Dijon mustard and fresh green dill combine in a magical way to make a dish that will leave people wanting more – or at least the recipe! 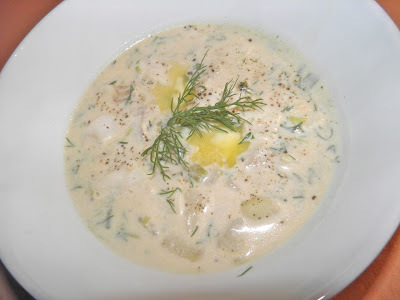 This is fish chowder, so you can imagine that fresh fish (or frozen directly after being caught) is a necessity. Most people who don’t like fish have probably had bad experiences with fish that is no longer at its peak. Old fish tastes “fishy" in every bad sense of the word. So how can you tell if the fish you are buying is fresh? There are visual clues that are easy to recognize. Here’s some basic info for both whole fish and filets. 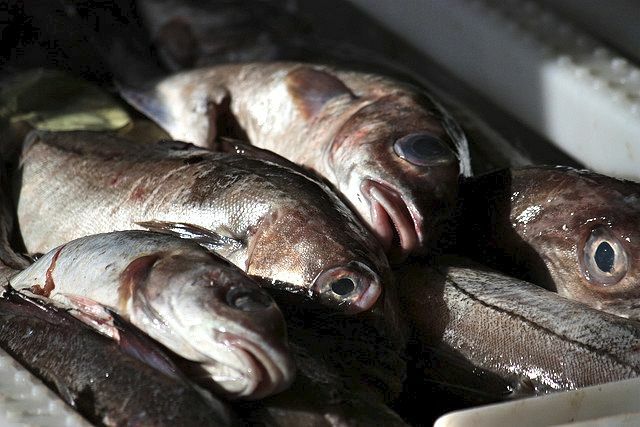 Fresh whole fish have bright, clear eyes. As the fish ages the eyes become clouded. The fish may still be safe to eat, but it is past its prime. Fish skin should be metallic, shiny and clean. If it is dull that’s a sign it has been caught a while ago. 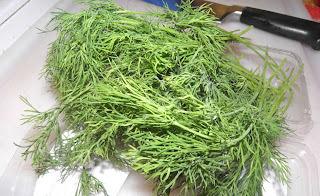 Fresh fish should also have very little odour, or if so a smell a little like the ocean. If it smells “fishy” don’t buy it. Fish gills also give a clue to freshness. Fresh fish have bright red gills. As the fish ages after being caught the gills change to a faded brick colour. 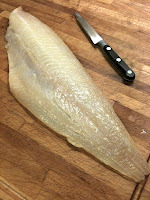 Fresh filets are sort of translucent. Fish that has been hanging around for a while becomes more opaque and “chalky”-looking. If the filet has skin, the skin should be as shiny and metallic as a fresh whole fish. Those two are easy ways to tell how fresh the fish is. Here’s two more. As with whole fish, smell it. Bad smell means old fish. If filets are packaged, check any liquid that may be wrapped up with it. The liquid should be clear, or nearly so. Liquid that has turned milky is a sure indicator the fish is old. If you’re able, press the fish with your finger.Any indentation should spring back and disappear. If your fingerprint remains, don’t buy it. Factory trawler fish is a bit more difficult to judge. Many larger trawlers have facilities onboard where they gut, fillet and freeze the fish within hours of capture. Trawler-frozen filets can usually be relied on to be fresh. So now you’ve purchased good, fresh fish, and it’s time to make your chowder. Cook the potatoes in just enough water to cover them. Melt the butter in a soup pot. Add the sliced green onions and sauté for 2 minutes. Add the potatoes and add just enough water to cover. 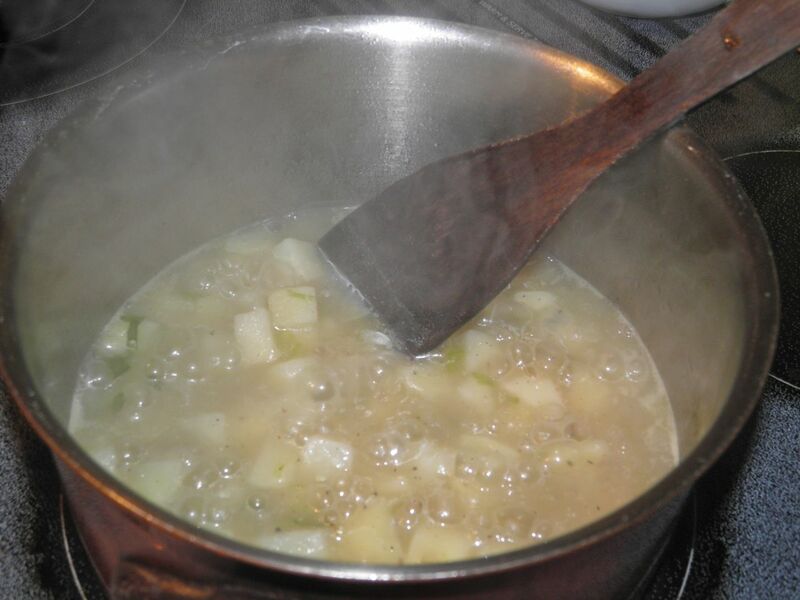 Bring to a boil, reduce the heat to medium high and let cook for 15 minutes. After the potatoes are soft, add the milk and evaporated milk, Dijon mustard and dill. Stir to combine. Next add the fish, stir gently and bring back to a boil. Do not stir vigorously or you will break up the fish. Once it reached boiling remove from the heat. 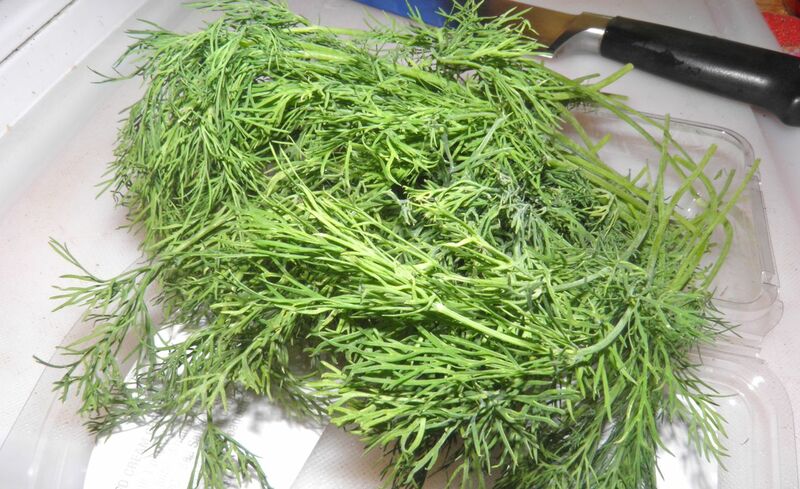 To serve, place the soup on bowls, add a piece of butter and a dill frond.